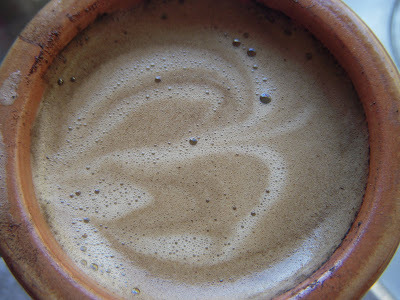 I think it looks like an om...and I'm taking it as a sign from the universe that I should continue to drink coffee. I love it when people talk about starting a business that can make the world better--and then actually do it. Which is why I really couldn't be happier to tell you about Om Goods, which is a San Diego based business selling a wonderful variety of stainless steel goods. They have 2, 3, and 4 tier tiffins, gorgeous carry bags and matching napkins for the tiffins, childrens' dinner sets, and more. So, here's the situation: I like to feed Nina three meals a day, but if you know kids, and especially my kid, you know that they are always asking for food, all times of the day. I did set up a snack cabinet for Nina but it's in one of the kitchen cabinets so the variety of foods is restricted to non-refrigerated foods. And then I saw this on the Om Goods site. 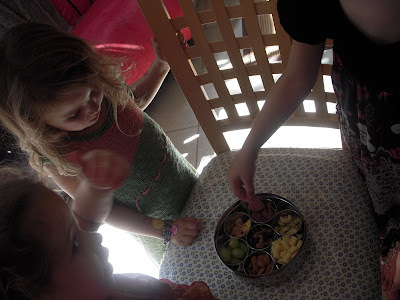 It's made for spices, but from the first time I laid eyes on it, I knew it would be perfect for little snacks that a child could help themselves to, without being waited on hand and foot. 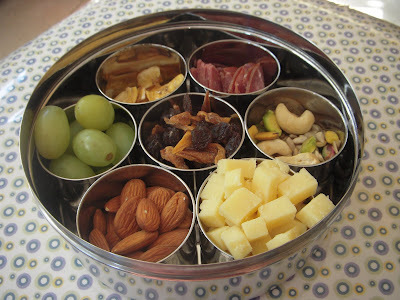 Here's what I came up with the first time I filled it: beef salami, mixed nuts, cheese, almonds, grapes, dried bananas, and in the middle, raisins and dried mango. I keep it in the fridge, and when I hear "I'm hungry" any time of the day, I feel comfortable telling Nina to go and help herself. And she loves having a little more independence. It went over pretty well, I think. I'm really glad to have it and I'm even more glad this company is out there. If you're local you can check them out every other Sunday at the Hillcrest farmer's market. If you're my friend on Facebook, you know that I really enjoy ironing. This was not always the case, however. What tipped the scales for me was getting an easy to use ironing board. I have one that goes over the door of my office and only comes down from the back of the door when I'm using it. No hauling it out of a closet and trying to find a place for it--it's just always there and easy to use. However, I have used it so much that I wore a hole in the cover, which means that I had to buy a new one. I know, I know, boring subject for a blog post--why would you even bother reading it? Well, all I know is that I'm really enjoying my new ironing board cover with its cheerful blue circles. 6 loads of laundry folded today, everything that needed to be ironed has been--now to put it all away, my least favorite part.